Italian magician (and I'm guessing comedian) Milleaccendini says this is a "world record". It's also allegedly for "science". It's not. It's all about Milleaccendini, and it's all the better for it. 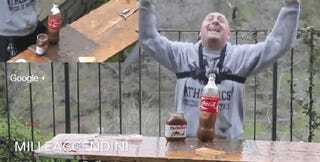 He combines Nutella, Coke, Mentos and a condom, ostensibly to simulate the effects on the human stomach if you took all those things together (and break a fake world record), but really just so he can make a funny video and get really excited about it. The entire thing is in Italian, but trust me, you don't need a translation. While we're on the topic of excited Italians, I think it's time you all met my favourite excited Italian, Tiziano Crudeli.